During the recording of Beatles for Sale, Paul McCartney was making polite conversation with his driver. “How’s it going?” asked Paul. “I’ve been working eight days a week,” responded the driver. In 1964, when McCartney turned his driver’s phrase into yet another Beatles hit, McCartney and the other Beatles knew exactly what the driver had meant. Since the release of their first single in late 1962, McCartney, John Lennon, George Harrison, and Ringo Starr had been in non-stop motion, writing and recording music, touring the world, making a movie, doing radio and TV interviews, and much more. In the new, widely anticipated documentary from Ron Howard, The Beatles: Eight Days A Week – The Touring Years, Howard does a fabulous (fab?) job of capturing the pandemonium surrounding The Beatles’ early years and the incredible work ethic of this remarkable band. 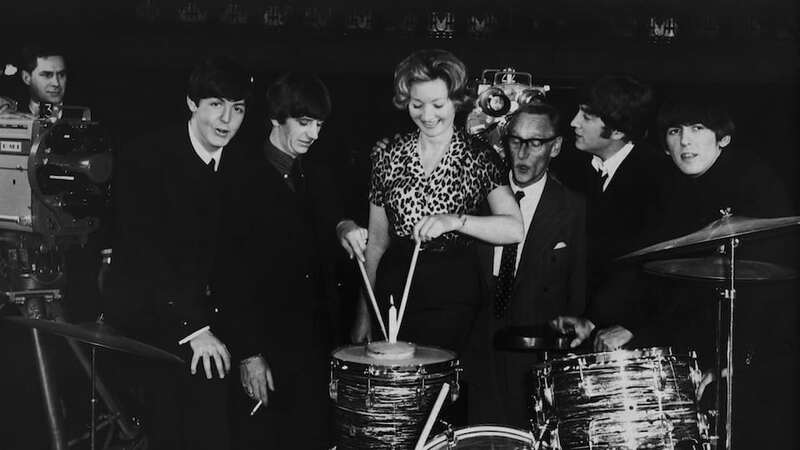 Eight Days A Week explodes right out of the gate with the opening drum fill of “She Loves You” and a live performance from the Manchester Apollo. The sound is spectacular and will put an immediate smile on your face. Moreover, this band is TIGHT. Their harmonies are spot on. Their playing is top notch. And it’s clear they are having loads of fun. The performances in this film will dispel any doubts about how great The Beatles were live. The music of the Beatles is so ingrained in our psyche that it is easy to forget how revolutionary they were when they first appeared on the scene. Four 20-somethings from England – not just from England, but from Liverpool – with long hair and boots – that looked and sounded differently than any other performers of the time. And the things that came out of their mouths! Watching their quick and witty responses to the inane questions from reporters proves that their personalities were a key part of their appeal. Eight Days A Week traces The Beatles from 1962 through 1966, hitting the highlights of the early Beatles story. The sheer hysteria of Beatlemania with girls (and a few boys) fainting, sobbing hysterically, and doing anything they can to touch one of the Beatles. Conquering America with their appearance on The Ed Sullivan Show. Their movies, A Hard Day’s Night and Help! The evolution of their songwriting and their first stadium concerts. Historical footage, including some previously-unseen concert footage, helps to propel the story. Having seen and heard many of these videos before, I was pleasantly surprised by how good they look. The audio is significantly upgraded thanks to the work of Giles Martin, son of the late Beatles producer, George Martin. The film is particularly good – thanks to these vivid restorations – at conveying the sheer power and magnitude of both the chaos (you can really feel the din at Shea) and of the band, whose music nearly exploded off those primitive stages. McCartney and Starr both offer on-screen commentary alongside earlier interviews with Lennon and Harrison. McCartney is especially gracious when talking about his fellow Beatles, Martin, and manager Brian Epstein. The film also contains a somewhat eclectic assortment of celebrities. Eddie Izzard talks about The Beatles’ sense of humor. Malcolm Gladwell talks about The Beatles’ influence on teen culture. It’s fun to see a young Sigourney Weaver at a Beatles concert in California, but Whoopi Goldberg’s story of her first Beatles concert is truly moving. Goldberg also highlights The Beatles’ appeal to African Americans. Later, historian Kitty Oliver describes how The Beatles refusal to play to segregated audiences helped change concerts throughout the South. It is hard to imagine how these four 20-somethings were able to deal with the madness that followed them wherever they went. Eight Days A Week gives us a clue by showing how The Beatles behaved like brothers, looking out for each other through the whirlwind of their early years. They shared the same work ethic and the same sense of humor. They were collaborators in and out of the studio. All their decisions had to be unanimous. The latter part of the documentary shows how touring turned sour and even dangerous for The Beatles. Even their 1966 decision to stop touring was made as a group. Eight Days A Week ends after that decision is made as The Beatles began an exciting new phase of their career, creating groundbreaking works like “Strawberry Fields Forever,” “A Day In the Life,” and the album Sgt. Pepper’s Lonely Hearts Club Band. Intensely creative years were still ahead of them. Yet, one is left with a feeling of melancholy knowing that their studio years heralded a loss of innocence (theirs and ours) and the disintegration of their brotherly bonds. The last glimpse of The Beatles, playing their final live concert on a rooftop in 1969, is enough to illustrate the greatness of the band and the vacuum left when they broke up the following year. Whether you are a devoted Beatlemaniac or someone who wants to know what all the fuss was about, Eight Days A Week is ninety minutes of pure pleasure. The documentary will eventually be shown on Hulu. But make sure to see it in the theater where it is accompanied by a remastered version of The Beatles at Shea Stadium, a 30 minute concert that shows The Beatles at their performance peak. Good article except for the fact that they weren’t teenagers.George Harrison was the youngest Beatle and he was twenty years old when they came stateside.McCartney was twenty-one and Lennon and Starr were both twenty-three. Good point. We stand corrected — and have edited accordingly. Thank you. QUESTION: Any word on when this documentary will be airing in theaters? As we understand it, the film will be released in theatres — for a very short run — starting Sept 15. It’ll be available on Hulu, though without the Shea Stadium concert bonus feature, on Sept 17.